For all those people who are interested in the Junior Eurovision Song Contest, here are the results and details for 2009. 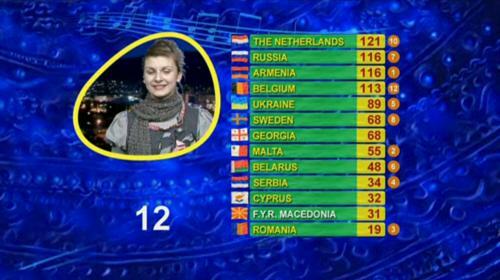 It is Netherlands first win (either Junior and main Eurovision) since 1975. The seventh Junior Eurovision Song Contest took place at the Kyiv Palace of Sports, Kyiv, Ukraine, on Saturday 21 November 2009. The contest last approx 2 hours. Ani Lorak, Timur Miroshnichenko and Dmytro Borodin hosted this event. Here are the songs and artist who entered the 2009 Junior Eurovision Song Contest and their final score.